For bus with Wi-Fi and lunch only. Assumes registrant has own theater ticket. Note: Member ($96) with guest ($111) will cost a total of $207. TO ADD YOUR GUEST: click on the "ADD GUEST" button at the bottom of the registration form and enter the guest information as indicated. Thank you. Registration fee includes bus with WiFi and also lunch. Join us Friday, November 9th, for our final American Players Theatre (APT) play of the season, Engaging Shaw, by John Morogiello. Synopsis: George Bernard Shaw is well known for his writing, wit and commitment to social justice. But in his time, he was also known for being an unrepentant philanderer. His aversion to marriage was so strong that he clung to it even in the face of the clever and charismatic Charlotte Payne-Townshend, who is clearly more than a match for him. Urged on by their friends Beatrice and Sidney Webb, the two would-be lovers trade witty barbs as they form a close friendship. The question at the center of this charming, romantic comedy is whether or not they’ll ever admit how close that friendship is. For more information on the play, see APT's Engaging Shaw website. You can also listen to an engaging (no pun intended) interview as Orange Schroeder talks with director David Frank in APT's Talkbacks to Go. 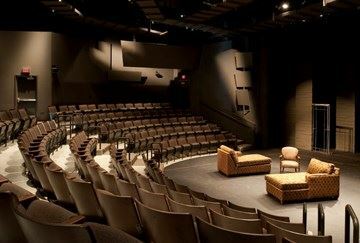 Engaging Shaw will be staged in APT's 201-seat indoor Touchstone Theatre. It's about a 5-minute stroll from the parking lot, up a gentle slope. (There is a shuttle available if you prefer to ride.) The path leads through the prairie to a beautiful, modern, intimate and climate controlled facility. Once inside, you'll find a gift shop, concession stand and rest rooms - the same amenities as the Hill Theatre (but to slightly smaller scale). More information about this theater. Accessibility Policy: On the Badger Bus, you must be able to climb steps to board and exit the bus. If you need assistance, we require that you bring a friend to give you a hand. Guest Policy: Members must register their guests. Each PLATO member is entitled to bring one non-member guest per bus trip. (Members may bring more than one guest near the registration Deadline Date if seats are available. Check with trip organizer.) Non-member guests pay an additional $15.00 registration fee. PLATO Membership is $60.00/year. A soup and sandwich buffet lunch at the Old Feed Mill is included in your registration fee. A dessert and non-alcoholic beverages are also included. There are no lunch options at APT in November. Bear in mind that our boarding bus route is like Madison Metro or any other municipal bus service. Please arrive 15 minutes early at your boarding stop so you don’t miss the bus. When everyone is aboard and seated, we leave. Arrive early and we will all arrive in Spring Green on time to begin our adventure. Don’t be late. We can wait just 5 minutes at any one location. Pack water bottles and snacks for sustenance on the trip. 12:20 PM Bus arrives at American Players Theatre. If using the shuttle, allow time for boarding--the route is short, but the bus may be small. 4:00 PM Engaging Shaw performance ends. Begin bus boarding for return to Madison. There will be adequate time for walking/shuttle and restroom use.